2012 IECC. In Massachusetts, Performance path is the way. 2012 International Energy Conservation Code (IECC) will soon be base code in Massachusetts. Advancing building energy codes are a bright spot during a period of lackluster sweeping federal energy policy. Massachusetts is proving to be a leader in the transition to ensure newly constructed buildings set a high standard for energy efficiency. Builders, designers, HERS raters, and energy consulting geeks should make it be known that they are ready to support the industry-wide shift to comply with the 2012 IECC (International Energy Conservation Code). Massachusetts is behind in adopting the 2012 IECC code. 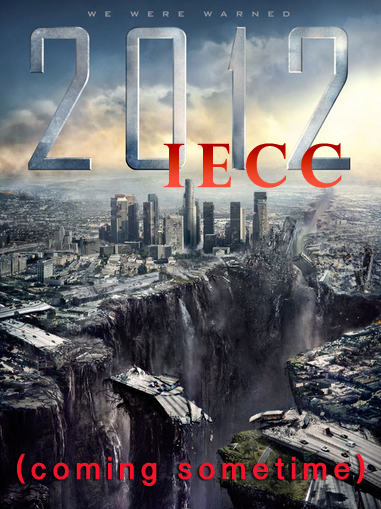 The 2012 IECC was published in July 2011, so we're a bit behind. The latest is that the IECC will be adopted with MA amendments, in the first half of 2013 with a 6 or 12 month concurrency period. With these changes coming down the pipe, all builders and designers should be making the shift now. It has yet to be determined how the Stretch Code (currently energy code in about 120 municipalities) will be impacted. Hopefully the approach is taken that improves compliance rates and doesn't drive any Green Communities to abandon the designation and the Stretch code. 2012 IECC will make a building right, and tight. The 2012 IECC represents a 30% improvement over the 2006 IECC. This new code, currently only active in Maryland, will encourage us to look back in 25 years and say, "hey we actually transitioned out of the cheap-oil age in our approach to new construction. It wasn't easy, but we did it". If the 2012 IECC is appropriately enforced, new residential and small commercial buildings in Massachusetts will be more energy efficient, healthier, more comfortable, and more durable. Meeting the code isn't rocket-science, though it will require new approaches to both the design and construction processes. After a few completed projects, positive feedback from building occupants, and confirmed energy savings, quality builders will embrace the required new building practices. 2012 IECC performance path for code compliance support and utility rebates. In addition to the mandatory required aspects of the code, there are three paths to compliance- prescriptive, UA trade-off, and performance. In Massachusetts the performance path option, which involves third party verification- usually a certified HERS Rating- is the best way to go. Why? Your HERS rater can qualify the project for Mass Save New Homes rebates. This utility program will pay for part of your HERS rating. By going the performance path with a HERS rater, you can have a skilled consultant on the project that will file paperwork for utility incentives and their fee will be subsidized by the utilities- what's not to like? In Western Massachusetts, HIS & HERS Energy Efficiency provides diagnostic testing and energy modeling needs to comply with energy codes and to qualify the Mass Save rebates. Check out our New Construction services page for more info. Here is a brief bullet list of some of the enhancements. For more details, check out this memo by the Home Builders Association of Massachusetts. Duct leakage maximum and testing: 4 CFM/100 square feet (down from 6 CFM/100 sq ft in the 2009IECC). Total leakage only. Exception if all ducts are within boundary. Passive ventilation: Eave baffles specified for permeable insulation. Performance Path: HERS Rating or other confirmed verification process required. Specific Index has yet to be announced as part of the Massachusetts amendments. 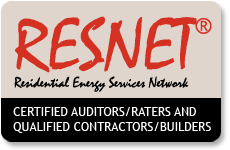 Contact HIS & HERS to find out more about our HERS rating and code compliance services. We would be honored to be on your project team. Newer PostWhen an Energy Audit isn't an Energy Audit.